Drive Electric Earth Day is an annual celebration and outreach effort that consists of EV activities staged in cities coast to coast and internationally. The goal is to share the experience of electric vehicle owners and bring information about the many reasons to adopt electric vehicles to consumers, policymakers, the media, and the general public. Drive Electric Earth Day is an outreach effort that consists of EV activities staged in cities coast to coast and internationally. The goal is to share the experience of electric vehicle owners and bring information about the many reasons to adopt electric vehicles to consumers, policymakers, the media, and the general public. We call each local lead organizer a city captain. Each city captain leads the organizing effort and ideally assembles a team of volunteers to ensure the success of a Drive Electric Earth Day event. This section describes what we have found to be the best practices for effective events. This section provides a basic overview of a city captain's role. A city captain can be anyone from a Plug In America, Sierra Club, or Electric Auto Assocation member to an enthusiastic EV driver. City captains have made all of the numerous events held for Drive Electric Earth Day	possible. It may be advantageous to invite corporations and municipalities involved in the EV space to participate in the event. Participation may involve donating money, food, or materials to offset the costs of the event; providing vehicles for showcase/test-rides; setting up a table or booth with information; providing a speaker; publicizing the event to their customers/constituents; etc. City captains are encouraged to ask their cities to officially sponsor the event. Promote Drive Electric Earth Day by issuing a press release, sending an email or mailing to customers, and/or trumpeting Drive Electric Earth Day on social media. To raise awareness of EV benefits among our youth, Drive Electric Earth Day has an initiative to involve high schools and colleges nationwide. It's simple: Each local event partners with a school or college near that event. That Ambassador School invites its faculty, staff, students and parents to the event and hosts an EV lecture, if desired. In turn, the local event adds the Ambassador School's name to it press releases. Invite its faculty, staff, students and parents to attend your Drive Electric Earth Day event. Name recognition in your media alerts and on the Drive Electric Earth Day website. Adding a newsworthy focus on youth education to Drive Electric Earth Day, which has the potential to help every City Captain and Drive Electric Earth Day garner more and broader media coverage. Drive Electric Earth Day is a great opportunity for local and national media coverage. Events will feature terrific visuals (EVs, engaged crowds, local leaders/public figures, award ceremonies, decorations, entertainment, etc.) that may be particularly appealing for television and newspaper cameras. The logo below can be used on flyers, posters, banners, and other promotional materials for Drive Electric Earth Day events. The logo must be used in its entirety and not modified or decorated in any way. A limited number of FREE event kits will be available to order in February for those events with a date, time, location, and approved event description. 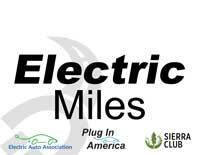 Event kits will include a banner and printed materials to educate your attendees about EVs.